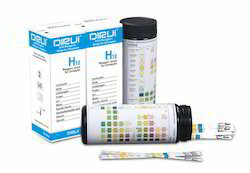 Leading Wholesaler of urine strips dirui h10 100t, urine test strips glucose ketone, urine test strips glucose protein, urine test strips glucose and urine test strips 10 parameter from Chennai. •Suitable for DIRUI H-50/100/300/500 Urine Analysers. A rapid screening tool for the semi quantitative detection of Glucose and Ketone in Urine Sample. • Requires no additional Laboratory equipment for testing. • Packed in an air tight plastic bottle containing a desiccant. • Read Time : Glucose - 30 Seconds & Ketone 40 Seconds. • Convenient packsize of 100 strips. A rapid screening tool for the semi quantitative detection of Glucose in Urine Sample. -Read Time 30 Seconds for Glucose and 60 Second for Protein. -Standard Pack of 100 Tests. : • Easy to use : Just dip and read no instrument needed. • Rapid Results : 30 second . • High Quality Colour Chart: Superior European-produced colour charts provide consistent,dependable readings. • Consistent quality with 2 year shelf life. 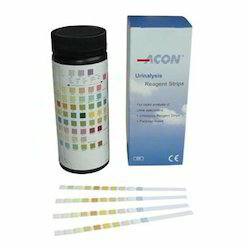 A semi quantitative test strips for the detection of Leukocytes,Nitrite,Urobilinogen,Protein,pH,Blood,Specific Gravity,Ketone,Bilirubin and Glucose in Urine. 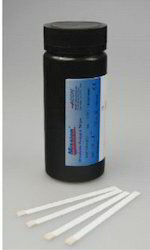 Features: Disposable Ready to use Read Time : 30 to 120 seconds Requires no additional Laboratory equipment for testing Packed in an air tight plastic bottle containing a desiccant Standard Pack of 100 Tests. Compatible with U120 urine analysers. Looking for Urine Strips ?